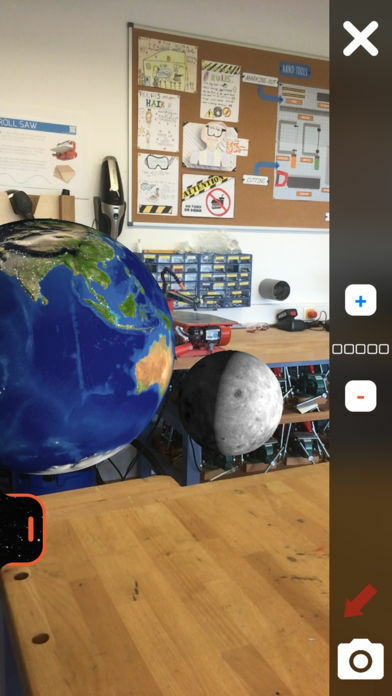 Moon Phases AR is an educational app which allows students to visually develop their understanding of moon phases and celestial scales through observation and physical movement. When accessing the app, you are presented with a simple, yet visually pleasing homepage, reflective of what the app represents. There are two main tabs to choose from depending on the content you wish to cover; indoor discovery view and outdoor scale view. In the top corner is another tab, which holds brief descriptions of the two modes to allow you to best fit your desired experience. 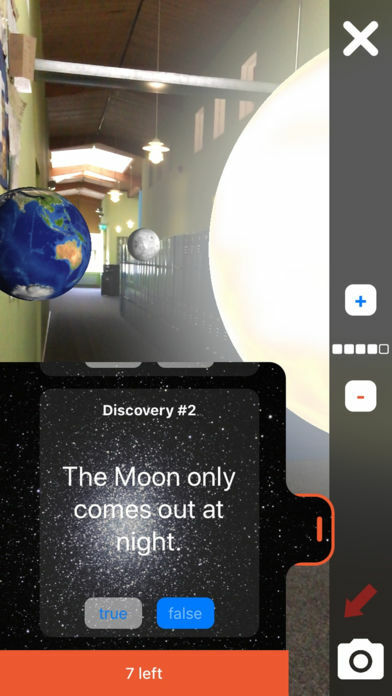 The ‘Indoor discovery view’ is the section of the app which will help students to understand the different moon phases, a concept notoriously difficult to visualise in a classroom setting. When accessing the ‘Indoor discovery view’ you are instructed to move into enough light to ensure the best experience in terms of the augmented reality you observe. The celestial objects are generated within your environment, and are incredibly clear, 3D in appearance, with smooth movements. The sun, moon and earth all appear, and the orbit of the moon and rotation of the earth can be sped up or slowed down to suit the users desire. 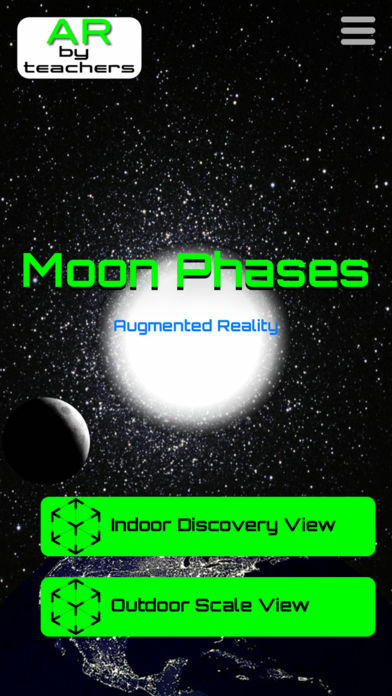 All possible moon locations are apparent when first entering the indoor discovery view, these positioning’s are transparent as to not distract from the main opaque orbiting moon. Along with these positioning’s are the names of each moon phase. However users can test their understanding by removing this extra information by toggling the red arrow, this allows for differentiation based on student’s prior understanding, and allows for sufficient challenge. Students are able to physically move their own position to observe the moon phase as seen from Earth. An incredibly useful aspect within this section is the ability to take a photo of these observations. This allows students to use this documentation at a later date to confirm or develop their understanding or to do further problem solving beyond the app. At the bottom of this screen is a tab which accesses 8 true or false questions for students to answer based around common misconceptions, this tab switches from red to green once all correctly answered, a lovely visual for student progress. Individuals are able to see how many questions they answered correctly and repeat as necessary. The outdoor scale view option allows users to practically comprehend the distances between the celestial bodies, and their relative sizes. As the name suggests, a larger area is needed for this option, ideal for an outside of classroom lesson, such as field work. Users are encouraged to visit the different celestial bodies, noting their sizes, and to see how far they are relative to each other by actively walking these distances. This physical approach will help student recall and understanding of scale. Again the visuals within this app are stunning and 3D, which makes for a more memorable learning experience. 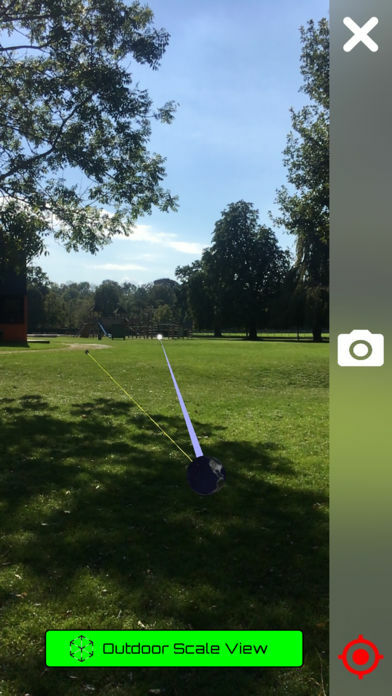 In addition to the apps novel AR approach are the provided resources that compliment the apps features. The true or false questions can be further developed by worksheets that encourage students to detail the observations they found from the app, which lead them to discovering the answer. These worksheets are levelled to provide support for a mix of abilities and are a fantastic way to make the app appropriate for classroom based learning and progress. 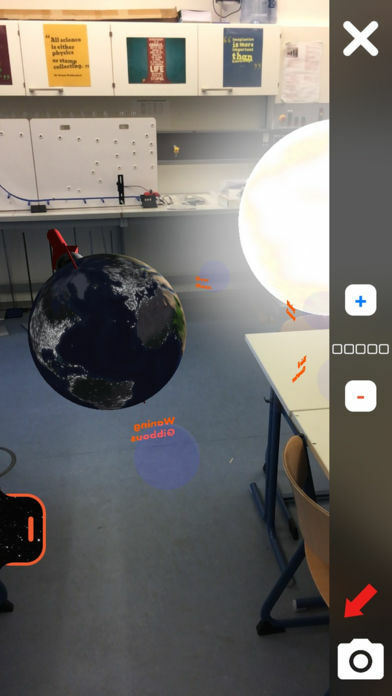 From an academic stand point the idea and premise of this app is promising, the AR approach is novel and provides students with a memorable learning experience. The carefully thought out accompanying worksheets make the use of this app within a classroom ideal. It is worthy of its current four star rating, and had enormous potential to grow beyond moon phases into other areas of difficult to observe concepts. 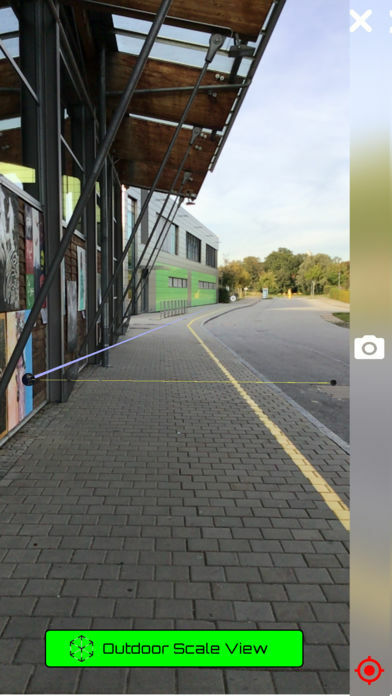 AR by Teachers - We’re teachers creating augmented reality (AR) learning experiences for our students, and of course, teachers! We want to engage students by combining pedagogy and contemporary teaching strategies with new technologies. 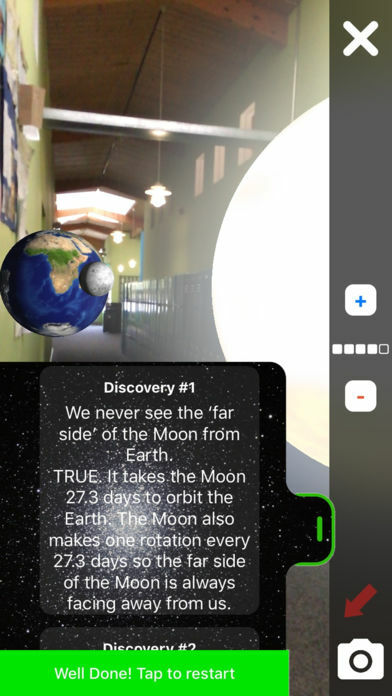 Phases of the Moon in Augmented Reality (AR) directly addresses important concepts that are not observable using traditional teaching resources. Students are faced with questions that require them to discover (Indoor Discovery View) the answers through observation in AR. In the Outdoor Scale View, students address concepts of scale through observation of size and distance in a large open space. 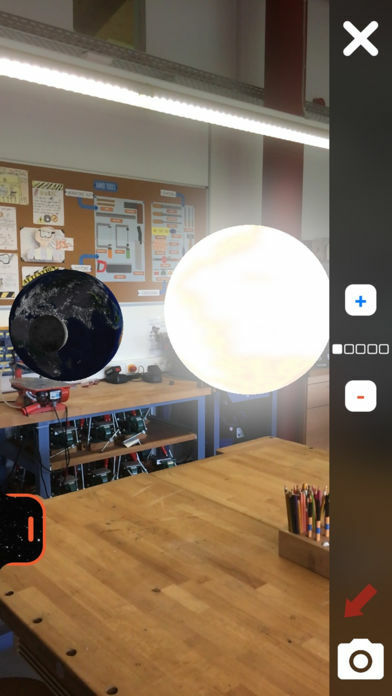 This AR app immerses students in discovery-based learning. Teacher resources are available for FREE at ARbyTeachers.com to print and use in your lesson. * Teacher resources are also available for Lower School, the app also suitable for teaching concepts of day and night.